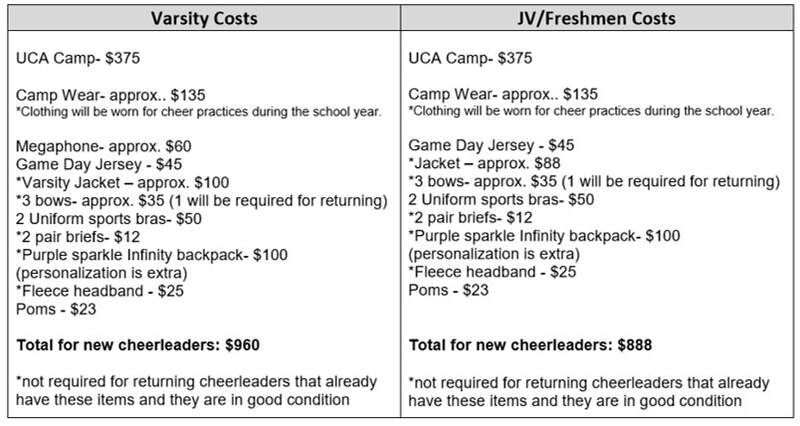 The following fees are a requirement for IHS Cheerleaders. They are estimates but should be a close representation of what is expected. As a returning team member, fees are lower because many items remain the same from year to year. Social activities, Homecoming activities, paint, community service projects, Pink Out shirt, team dinners, pictures, uniform cleaning, etc. UIL Competition Team Fee: (Includes choreography, entry fees, bows, lunch, shirt, photos) - $80. Participation is not required. Frisco ISD and Independence HS are unable to cover costs for cheerleaders. It is the responsibility of the parent to communicate with the sponsors if there are concerns making payments on time PRIOR to tryouts. Any items purchased in part or full, with school funds will be retained by Independence High School if the cheerleader is removed from the squad or voluntarily resigns the position. Payments must be up to date by March 30th in order for the cheerleader to attend camp. Camp is mandatory for all squad members.